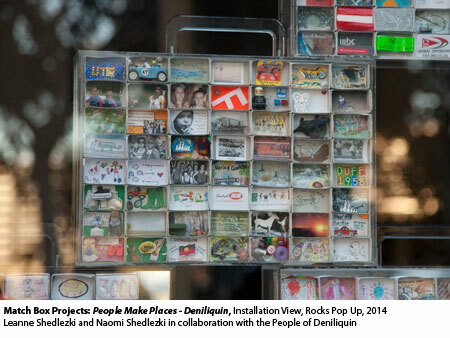 In 2011 we met over 100 locals In Deniliqin who all created inside one of our matchboxes, something they wished to share with the world about Deni for a Deniliquin Time Capsule for our “People Make Places” Match Box Project. This�Time-capsule has been travelling with us and has been exhibited in 10 cities across the globe, where the project has also grown box by box. We are passing by Deni for 24hrs on the way to create the project in Adelaide. Whilst in Deni we would love to share the Deniliquin Time Capsule��together with some of the 2000 more boxes we have collected across Melbourne, Sydney, Mosman,��Shanghai, Venice, London, Berlin, Edinburgh and Dubai. This entry was posted on Tuesday, March 24th, 2015 at 8:15 am	and is filed under Our Blog. You can follow any responses to this entry through the RSS 2.0 feed. You can leave a response, or trackback from your own site.